Issue no. 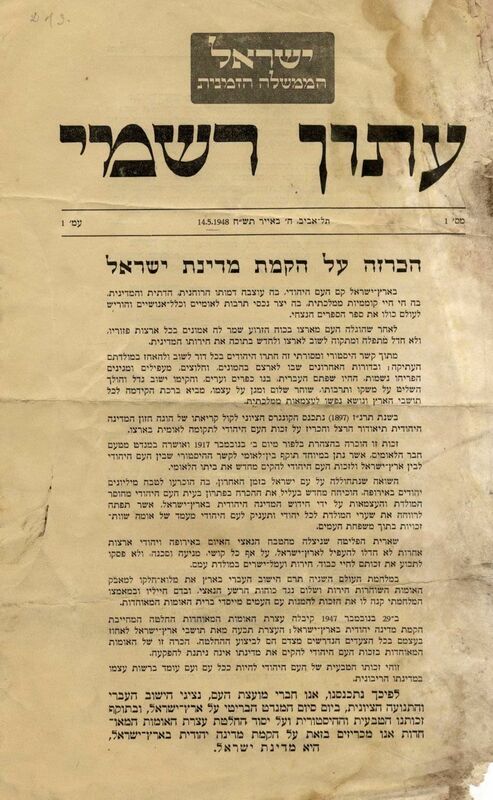 1 of the official newspaper, HaPoel HaTzair Press, Tel-Aviv 14/5/1948. Printed on behalf of the provisional government. The declaration of the establishment of the state of Israel was printed in this issue, the historic reasons to justify its existence, and the foundational principles of the state. A manifest on behalf of the provisional state council is printed on page 4 with the authority of the state and the cancellation of the White Paper. Tears and stains without damage to text. Poor-moderate condition.